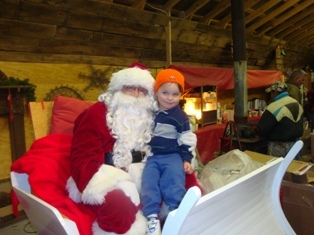 Santa visits and more fun at a Christmas Tree Farm! If you've never been to a Christmas tree farm, you may not realize that most tree farms are much more than just a field with trees and a cigar smoking Bubba sitting in a folding chair like in the movie "A Christmas Story". The farms - and farmers - have evolved a lot since your own childhood. From Santa visits, hay rides, hot cocoa, s'mores, farm animals and sometimes even live reindeer; you can have a fun half day at a farm. Here's an overview and what you need to know. Santa visits some farms, typically from 12 pm to 3 pm on Saturdays, Sundays, too, IF the farm is open on a Sunday (many aren't). There's usually no charge, unless you want a photo, so bring your camera! There can be a line to wait at the larger, busier farms, but it is usually is a MUCH, MUCH shorter wait than at a shopping mall. And these Santa's are excellent; the real thing! I've taken my children to the same farm and same Santa for the past 10 years. 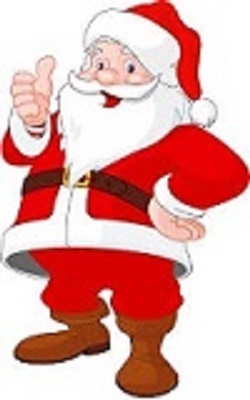 BE SURE TO COMFIRM SANTA'S DATES AND TIMES AT THE FARM DIRECTLY WITH THE FARM either on their website, Facebook page or better still, by phone, to confirm the date and times when Santa will be there. I put the scheduled dates and times on this website, but much can change: weather conditions, the Santa can be sick, the farm may sell out of trees early - I simply cannot emphasize enough to check with the farm before you go to avoid disappointment. 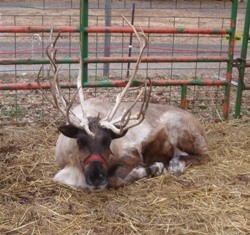 Yes, you can see, and sometimes even pet, real live reindeer at a few of the farms. There's no guarantee that they are Rudolph or any of the original eight (Prance, Comet, Totallyblitzed, Sneezy, Lumpy, Doc, etc... I never can remember their names) but they are big, hay-munching real reindeer! If you've never seen one up close, they are big, usually fairly friendly and distinctively different from ordinary white tailed deer. Children are fascinated by them. You have to give credit to the tree farmers for being creative by bringing reindeer in! Some farms have winter villages with a miniature North pole or other playground activities. Others have actual rides. 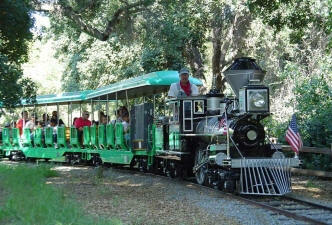 A few even have narrow gauge trains! More common are drive-through Christmas light displays (only at night, of course!). Some of these may be 1 to 2 miles long. 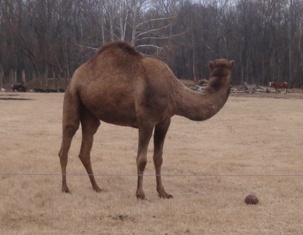 Common to many farms, a petting zoo allows your children to actually pet or touch some animals. Typically, rabbits, goats, chickens, sheep and sometimes more exotic animals. Hand sanitizer and/or a washing station must be present under many state laws and common sense! If the listing includes "farm animals" this means you can see, and be within a few feet of the animals, but not touch them. Usually they're behind a fence. Often, cows and larger farm animals are present! Who doesn't like a hayride? The rides often take you around the farm, frequently out to the fields where the trees grow! Often free, a few farms charge $1 to $3. Most are tractor-pulled, but a few are horse-drawn. Like a hayride, but you sit on benches instead of hay bales; still fun! 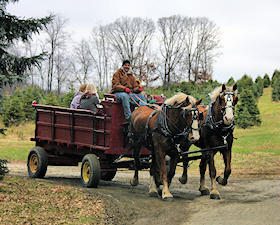 Sometimes, the term wagon ride or hayride is used interchangeably. Sometimes they are horse-drawn, other times, a tractor is used to pull the wagon. 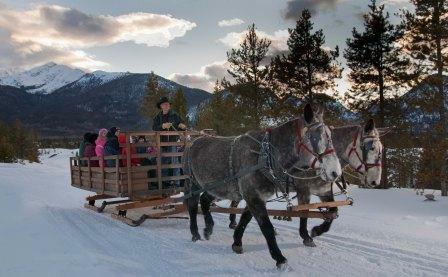 If you are REALLY lucky and the weather cooperates, a few farms offer sleigh rides, on a real big, horse-pulled sleigh! Except in very cold northern or mountainous area, these are usually catch-as-catch can, meaning you must call in advance to reserve a spot on a list. Then IF there is a sufficient snowfall, they will call you back and ask if you want to go. Often stables, that do NOT sell trees, offer sleigh rides, so be sure to check! This page has links to the sleigh rides we know of, listed by state!